University of Wisconsin, La Crosse law dispatcher was fired when she defended Trump’s immigration policies while having a conversation with a coworker. The university fired her on the grounds of “threatening or abusive language” and “conduct unbecoming a university employee”. She was offered her job back 3 days after receiving her termination letter though, after Twitter and other social media platforms started to report on the firing. Refutation: What About the Economy? We all know that Donald Trump’s main goal in implementing his travel ban is “protecting” American lives, but is the injustice he is forcing upon the many immigrants and refugees trying to enter the country really worth the potential economic pitfalls? According to Forbes, the travel ban can have some serious implications for trade and the U.S. economy, including tariffs, in addition to copying Trump’s order and implementing it in their own country, making business a lot harder for companies that have manufacturing plants outside of the U.S. Similarly, one of the bigger economic impacts that Trump’s policy could lead to is a decrease in overall tourism in the United States. 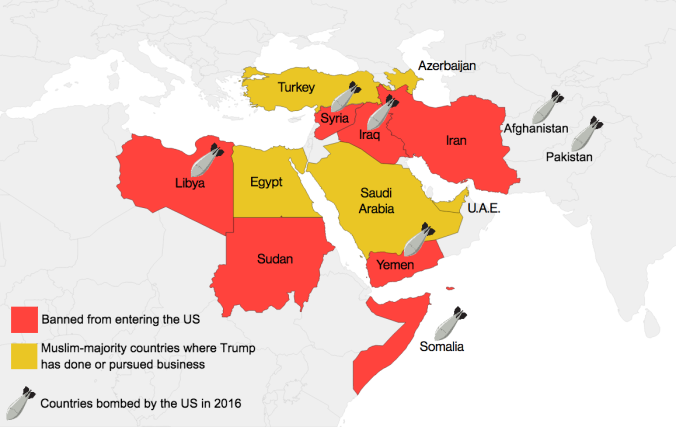 Although the ban makes it impossible for immigrants and refugees to come to America from seven predominantly Muslim countries, the sheer fact that the United States is partaking in an extremely exclusive, threatening foreign policy is enough to scare some potential visitors from other un-banned foreign countries from visiting. This could cause the U.S. to lose substantial income from tourism, even if they are not directly effected by the travel ban. Not only that, but it could have implications for the American education system as well, especially in terms of foreign students coming to America for college, which could effect costs for United States citizens attending college. International students made up 5.2% of the college system in 2016, and the fear is that the students being banned from the country due to the travel ban will decide not to enroll in the fall, and could also effect the choices of students of countries who are not on the ban list, much like the tourism debacle. Although the protection of the American people should be the top priority of the President, the extreme nature of his ban and it’s deterrence of tourism should not burden the many Americans who suffer from this ban. President Trump needs to fully understand the economic implications of this plan, not just the implications for the Trump brand, to see if this is truly the best plan for America and the refugees and immigrants seeking safety. Affirmative: What would America be without immigrants? With the recent uprising and hype regarding the status of immigrants, many people have done research and reports on what America would be without immigrants. Many people tend not to recognize all immigrants have done for our country, and the strides and hard work they put in to get here. There is a difference in the impact that legal immigrants have versus those who are illegal, but there is some impact either way. Technology is a big factor in today’s society, and immigrants have contributed to it’s growth more than one would imagine. Without immigrants, out “unicorns” would not exist. “Unicorns” not referring to the imaginary creature, but the apps that allow people to travel from one place to another with simply the click of a button and the payment being connected to a credit card. Some common unicorns are Uber or PayPal. About 40 billion-dollar companies would not have been founded without immigrants. If one looked at all the “unicorn” companies worth one billion dollars or more, 51% had a founder not born in the USA. Also, 70% of those “unicorn” companies feature immigrant workers that play large and key roles within the company. STEM is a technology based field that immigrants tend to lead, thrive, and do very well in, which may account and contribute to their creativity regarding app creation. They tend to hold a lot of STEM degrees which increases and helps when it comes to job multiplication. It is now statically proven that when there is one immigrant working in a STEM field, they are responsible for creating 2.72 more jobs. Lastly, immigrants are making strides in fields outside of STEM, and in broader areas of patents and inventions. Immigrants are involved in 76% of patents from top patent producing companies in America, reported to help mankind in many ways. These patents are both technologically and pharmaceutical (medicine based). Trumps new Attorney General Jeff Sessions discussed his intensive and aggressive take on immigration. He has made it clear that the Trump administration’s immigration policy will be strict and aim to deport undocumented immigrants. This has already begun. In this video, Judy Woodruff speaks with Nancy Montoya, who works for Arizona Public Media. Woodruff and Montoya discuss Sessions’ comments and Trump’s new immigration policy. “There is no safety net anymore. If you are here and you cross the border illegally, the Trump administration is putting you on warning that you could be next,” said Mantoya. In this video, popular talk show host, James Corden, walks through the airport to show how easy it is for him to get through security. The purpose of this is to show that all legal immigrants should be able to have it this easy, not just White Christian ones. While those countries have a travel ban, there are still 33 that do not have any restrictions. The argument that by banning just those 7 countries will eliminate foreign-terrorists from entering the country is ludicrous. According to Nowrasteh, between 1975 and 2015, only 20 refugees have been convicted of attempting a terrorist act (zero Americans were injured/killed in these attempts.) Additionally, it can be seen in the previous article, that out of 580 terrorist related convictions, 92 people were U.S Citizens, while 40 were foreign-born, and 241 were not actually for terrorist offenses. This proves that banning entry to Syrian refugees and individuals from the seven banned countries does nothing to prevent more terrorist attacks. Trump’s ban is only doing more harm than good by damaging international relations, blocking families who are only seeking safety, and inciting domestic tension. Affirmative: Money Money Money…is on everyone’s mind.